Ensconced in the northern coastal jet-setting playground of Porto Cervo, Sardinia, famous for its jeweled-toned sea, sits another gem portside_not to be overlooked. While the buoyant glitterati ready yachts and great sailing vessels for adventures in paradise_ toasting to the magnificence surrounding the Bai of Sardinia, and the curious gather for celebrity sightings along the The Costa Smeralda, the Promenade du Port aka The Costa Smeralda Hub_ lies several meters inland from the mighty seafaring crafts. Designed as a “luxury space where people can gather day or night”, it is complete with international art galleries, high-end retailers, bars and fine dining establishments, and an array of events_ all with first class offerings. Paci Contemporary Gallery is among those glamorous offerings. Sitting pretty, shade side, the Paci Gallery sets its own course. 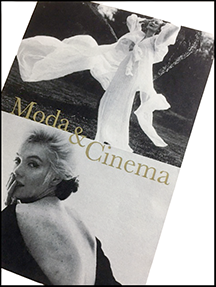 Currently playing host to several photographic legends on both sides of the camera with an exhibition entitled “Moda and Cinema”, I was delighted to have the opportunity to view this collection of some of the most iconic women of the silver screen. The beauty was delivered_san aucun doute, not only detailing trends in fashion and makeup, but the posture, allure and enchantment of decades past, now preserved forever in archives, and brought back to life as the current vogue dictates. While the exhibition is well suited to it’s locale (Prince Aga Kahn’s creation) Paci’s presentation of the provocative and seductive is an engaging selection by the likes of such photographic luminaries as Douglas Kirkland, Bert Stern, William Klein, and Terry O’Neil, among others. What is evident as you make your way around the gallery is how the photographers are aligned in the use of a “language”. To connect with their subject, the photographer must secure trust. The language is flirtation_ both visual and spoken, and very subtle, as it is the most important element in this photographic process. As an example, and most notably, Bert Stern has captured his star_ Marilyn, allowing the viewer to access the defining moment where intimacy is captured. And the result from Stern is clear in the outcome_ Monroe’s vulnerability. With vulnerability revealed, the intention is a success. You can still catch the works, as they are on display until 30 September.